Turns out John DOES read my blog. I'm both embarassed and very much in love with him. This will be a short blog as I have a lot of work to try and cram in tonight before bed. My sister's birthday is on Friday and since I won't have time either Thursday or Friday to do any baking, I made her some cupcakes. First - a quick bit of info on my sister. She is, as of late, enamoured with everything Country. The music, the lifestyle, John Deere...you get the drift. 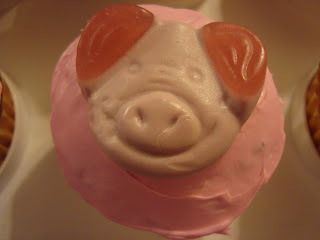 Also, since she was a child she's loved pigs. She had a stuffed one named Thomas that was her constant companion for a lot of her childhood. 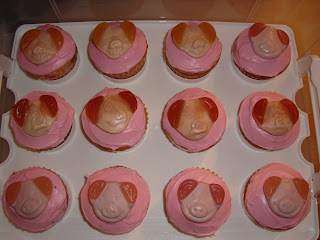 So in that vain I decided I would theme-up my cupcakes. These also owe a big thanks to John's sister who brought us back these delicious gummy candies called Percy Pigs (the one's in the bottom row that aren't misshapen :s). The top row are ones I bought at Metro, 2/3 of the bag had faces like monsters. I bought this from Costco a few weekends ago - best purchase in awhile! 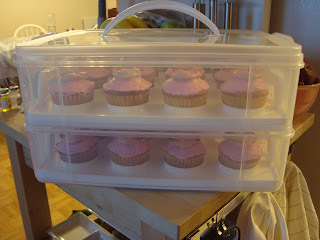 There's a third carrier also but I didn't have enough cupcakes to fill it. Anyway, I'm very much looking forward to the Thanksgiving long weekend. I'll put up some photos from the Metcalfe fair and add some thanksgiving recipes too. And perhaps some stories from Robin's birthday on Friday! So, to leave off - in the words of Mr. Jack Donaghy himself, Alec Baldwin, happy birthday you "rude, thoughtless pig" - on Friday.